We recently did a review of some governance indexes and social accountability assessment frameworks. Apart from those that we were more familiar with, like World Bank’s Worldwide Governance Indicators (WGI), Transparency International’s Corruption Perceptions Index (CPI), and Global Integrity’s Global Integrity Report (GIR), we randomly selected those that came out of a cursory online search and which we deemed would have some interesting lessons for us in terms of developing ANSA-EAP’s own social accountability (SAc) monitoring and measurement tool. Out of the ten (10) indexes and assessment frameworks that we examined, four (4) were global in scope, proposing some measures for governance quality that were supposed to be applicable across countries and regions. One (1), the Ibrahim Index of African Governance (IIAG), provided a regional assessment framework for African countries. Two (2) outlined a national framework for comparing governance quality across component provinces and municipalities. Three (3) of the assessment tools were primarily meant for application at the local level. 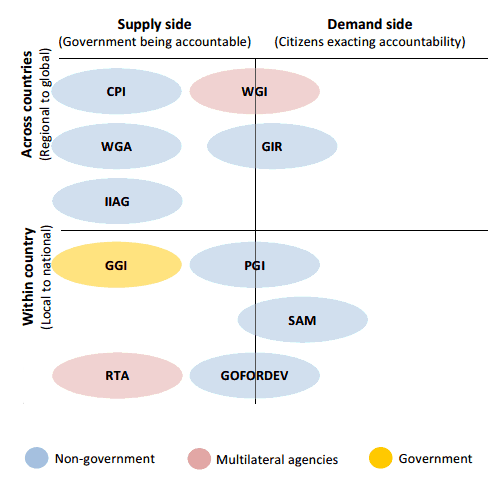 Most of the indexes and assessment frameworks view accountability from the so-called “supply side” – i.e., government having internal mechanisms for effective checks and balances, being more responsive to citizen needs or demands, or providing information and spaces for constructive engagement. Only two (2) – GIR and Social Accountability Monitoring (SAM) – have clear bias for measuring the capacities of ordinary citizens and citizen groups to articulate their demands, monitor the government’s performance, and hold public officials accountable for their decisions and actions. Majority of the indexes and assessment frameworks used ground-level data gathering methods. These included monitoring visits with local governments and communities, interviews with so-called “well-informed persons” (WIPs), securing official documents and records (e.g., minutes, budgets, financial reports, etc. ), household surveys, experts’ scorecards, reporters’ notebooks, perception surveys with citizen groups. Four (4) of the ten assessment tools relied on indexing or surveys done by other groups. Seven (7) out of the ten indexes and assessment frameworks that we reviewed tried to go beyond measurement of what were considered to be important inputs and processes for good governance, and have brought in some indicators on results or impact. These were primarily in terms of improved governance practices, better public services, and enhanced welfare and protection of rights. Some, like the Good Governance for Local Development (GOFORDEV), put government impact squarely up front. We’re sure that our colleagues and partners in SAc would have some issues on how we placed those colored ovals in the graphs. 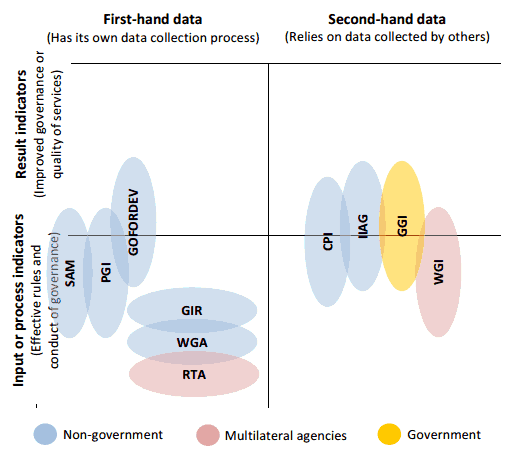 No doubt they can draw out more lessons from the matrix that we prepared to compare the different governance indexes and assessment methodologies (see attached file). We do encourage everyone to revisit our data and findings, validate or enhance our analysis, and post comments or questions here. This is in line with our goal of making ANSA-EAP’s research initiatives more participatory and iterative. In the second part of this blog, we share our initial reflections about the SAc index.